With the impending nor’easter heading toward the mid-Atlantic and southern New England, homeowners have been stocking up on supplies in preparation. Many may also be thinking about ways to prevent damage to their trees and shrubs that may be caused by a heavy snow burden. the weight of the snow. With snow accumulation, if it’s not too wet and heavy, you can sometimes take a broom or a leaf rake and gently brush the snow from the branches. If you keep up with this throughout the storm, you can prevent a heavy buildup. It is best not to shake the branches as this can cause breakage. In the case of an accumulation of ice or heavy, wet snow, it is better to just wait and let it melt off naturally. If you try to knock it off you will usually do more damage to your trees and shrubs. It’s also very dangerous! 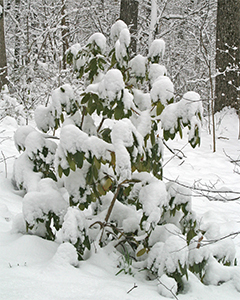 Most trees and shrubs will bounce back after the snow or ice melts off so it is usually safer to be patient and wait until they thaw out. Snow damage is usually worse on evergreens because the foliage can hold the snow on the branches. 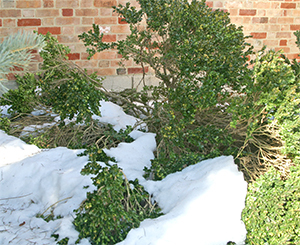 Sometimes, the outer branches of shrubs like boxwood, yew, and azalea become weighed down with snow, separated from the center, and pinned to the ground. If you try to remove the snow, you can do more damage to the shrub. Let the snow melt off naturally! Once everything melts, you will be able to see if any permanent damage was done. 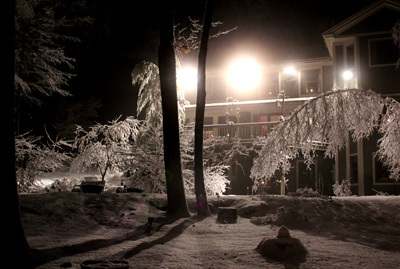 What should you do for damaged trees in the aftermath of a destructive winter storm? The most important thing is to be safe! Don’t go near trees or branches that have fallen on power lines. Watch for large broken branches that are hanging precariously and could fall in a gust of wind. Assess the damage to determine if it is something that you can handle yourself or if you need to call in a professional tree service for help. Large limbs can be extremely heavy (hundreds of pounds) and dangerous! Avoid any trimming or pruning that necessitates getting up on a ladder. This can be extremely dangerous especially if there is snow or ice on the ground. When using a pole saw or trimmer, be mindful of any telephone or power lines and stay well away from these. It’s very easy to lose track of where they are in relation to where you are cutting! Better yet, leave this pruning to a professional. The first thing you need to do is evaluate the damage to your tree. Study it from all angles and determine the best way to proceed. Severe damage may warrant a call to a professional tree service like Bartlett Tree Experts, while more minor damage can often be tackled by the homeowner. 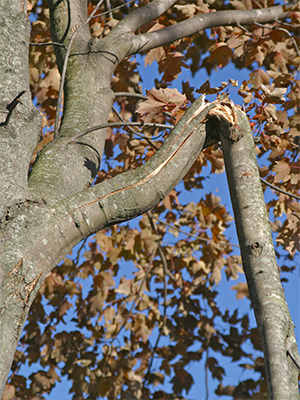 Broken branches are one of the most common types of storm damage to trees, whether by snow, wind, or heavy rain. The three D’s of pruning dictates that you can remove these broken branches at any time regardless of when they occur. This is mainly because the ragged wound left from the break can be an entrance point for insects and disease. Remember, hire a professional to remove very large branches or those that you can’t safely reach from the ground. Ladders can be very dangerous for pruning! Make clean cuts by using a sharp tool – a clean cut speeds callus formation and healing. 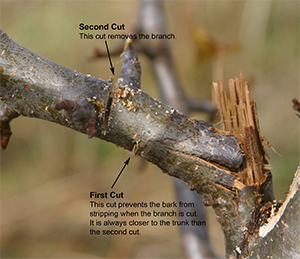 When removing a branch, make the cut close to the stem just outside the natural branch collar. The branch collar or bark ridge is an area/ridge at the base of a branch that contains cells that multiply quickly to close off and heal a wound. 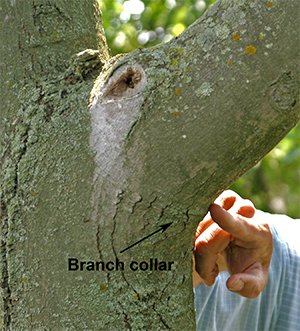 If you cut the branch inside this branch collar, you hinder the natural healing properties of the tree. just outside the branch collar. Do not leave stubs. Leaving a stub is almost worse than cutting the branch too short. 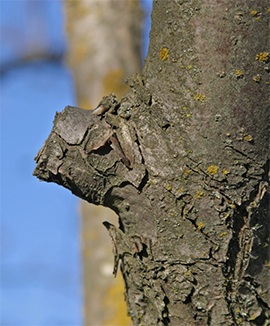 Stubs will die back and leave the tree open to disease and insect damage. The tree cannot heal over a stub. Smaller branches, less than 2″ in diameter, can be removed with one cut using good quality shears or loppers. Remove larger branches in sections. This takes the weight off the break and makes the final pruning cuts easier and safer. Once you have a shorter section to remove, use the three-cut method to remove the branch completely. 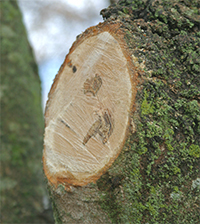 The three-cut method prevents tearing or stripping of the bark as the final section is removed. The first two cuts of the three-cut pruning method. The third cut will remove the remaining stub. There is generally no need to use any kind of wound paint. Painting the wound can inhibit the natural healing of the tree; however, sometimes larger cuts can be coated with orange shellac. If a branch has broken and peeled the bark down on the trunk in the process, remove the branch using the procedure above and then trim off any loose bark. In many cases, depending on the species of tree, younger trees can bounce back from fairly severe damage – up to 40% loss of their branches. These smaller trees should be pruned to remove damaged branches, making new clean cuts back to a branch collar. 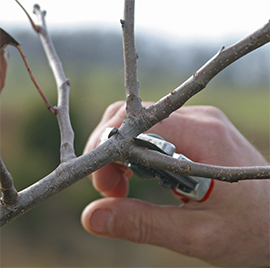 If just the tip of a branch is damaged, prune the branch back to an outward facing branch or bud. In the late spring, you will be able to determine if the tree has survived. Summer pruning may be necessary to reshape the tree and remove additional dead twigs or branches. In cases of severe damage to larger trees, it is best to consult a certified local arborist such as Bartlett Tree Experts to get their recommendation on whether the tree can be salvaged. If the loss of branches is greater than 40%, the chances of survival can be greatly diminished and you may have to have the tree removed. Even if it survives, it may be severely weakened and it may become a hazard in the future. It’s wise to consult a professional arborist to determine a course of action. Trees are a renewable and replaceable resource. If you are forced to remove a tree, consider replacing it with a tree that produces well-spaced, wide angled branches which provide greater strength and resist breakage. To eliminate the problem of trunk splitting, look for trees that produce a single main trunk. Bradford pears are very popular landscape trees but they have weak branches and are very prone to storm damage. Consider the loss of your tree an opportunity to try an exciting new variety! Until next time – Be safe and enjoy the snow!